Plan, organize and host events like a pro — even if it's your very first time. Ever notice how the best events look effortless? Everything just seems to unfold perfectly — and at just the right moment. A well-planned, well-run meeting, retreat, or convention is a thing of beauty. However, anyone who has put together such a gathering knows it is anything but easy and effortless. Nothing — not even the smallest detail — can be left to chance. If there's ever a time when you can count on seeing Murphy's Law in action, it's during an event. Anything that can go wrong will go wrong. 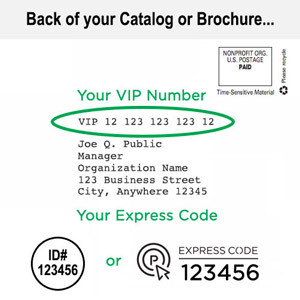 As the designated meeting planner, you are responsible for making sure that doesn't happen. It's not my real job. I'm out of my "comfort zone." Most likely, event planning isn't your primary job. Somehow, the responsibility just landed in your lap. And now, it's up to you to bring it all together like clockwork to create the memorable occasion everyone is anticipating. Get the tips, techniques and tricks the pros use to put on flawless events. The truth is, there's nothing magical about putting on a well-run professional gathering. Being organized, doing the right things at the right time, and understanding a few key strategies will lead to success. You'll discover the inside track at this seminar — and come away with the confidence you need to pull everything off like a real pro, even if this is your first time planning an event. 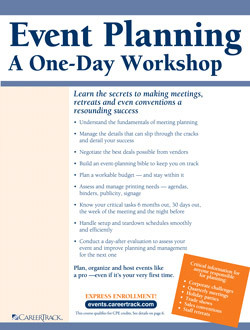 Spend a day with us in our event planning course, and save yourself the worry, wrong turns and wasted effort.